About a month ago I bought a digital television subscription from my cable company. The service is called UPC digital and promises to deliver great content, great quality and a some interactive services. I received the Motorola DVi-4000 set top box last week and so far my experiences are pretty good. UPC Digital is pretty good, but it’s not perfect. There are some things that could be handled better and one thing includes wide screen support. There are basically three types of content being broadcast on the UPC Digital network. There are a limited number of channels that broadcast in anamorphic widescreen. The Dutch public access channels, Nederland 1, 2 and 3 have mixed content with some content in anamorphic widescreen. The same applies to German and English public access channels. The Belgian public access channels also broadcast widescreen content, but instead of using anamorphic widescreen, the content is broadcast using a letterbox, inside a 4:3 frame. Most of the traditional commercial and theme channels broadcast regular 4:3 content, but sometimes they do broadcast widescreen content. The widescreen content of these channels are being broadcast using a letterbox within a 4:3 frame. The UPC digital set top box does support widescreen television sets, but unfortunately this support is fairly limited. You can setup the set top box to output a wide screen signal, but this can lead to reduced quality for non-widescreen content, and even a completely unusable situation for widescreen content that is broadcast using a letterbox inside a 4:3 frame. Below I will try to explain what happens for every type of content when the set top box is setup to output a widescreen signal to the television set. 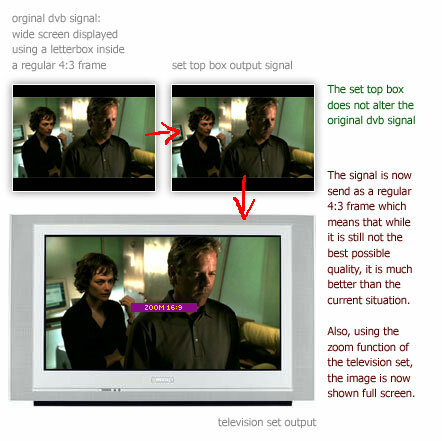 A DVB stream that contains regular 4:3 content is converted by the set top box into an anamorphic widescreen signal. During this conversion, the frame is resized horizontally to 66% of the original width and black bars are added to both sides. This means that 33% of the original DVB stream is basically thrown away. The same applies to widescreen content broadcast using a letterbox inside a 4:3 frame. The content is resized horizontally, leading a loss of quality. An additional problem is that because the output signal is anamorphic widescreen, the television set can no longer use it’s built-in zoom function to make the actual widescreen content display in full screen. This result is that you have to deal with large black bars on both sides, but also on top and the bottom. So letterboxed widescreen content is not only reduced in quality, but also displayed much smaller than necessary. Anamorphic content is displayed just like it should be. It is simply send to the television set as-is which makes sure the quality is as good as it gets. So, anamorphic widescreen content is handled just like it should be. Letterboxed widescreen and regular 4:3 content suffer from reduced quality. Letterboxed widescreen content is even pretty much useable. The solution: modify the way letterboxed widescreen content and 4:3 content is handled by the set top box. It should be possible, because the firmware can be remotely changed. Also, every technical feature you’ll need to make this modification is already there. UPC just needs to make some rather small changes to the firmware. Each DVB stream already contains information about the type of content the stream uses. The set top box already uses this information when it is setup to output 4:3 content. This information could also be easily used for anamorphic wide screen content. The set top box also supports sending WSS signalling. 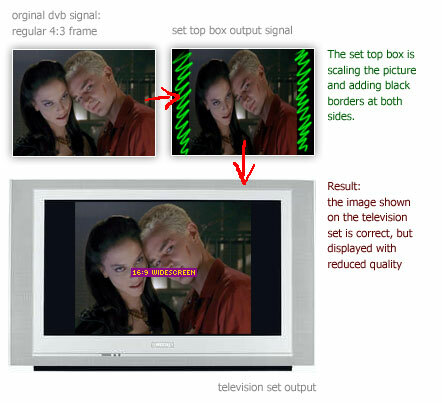 All current widescreen television sets also support receiving of WSS signalling. 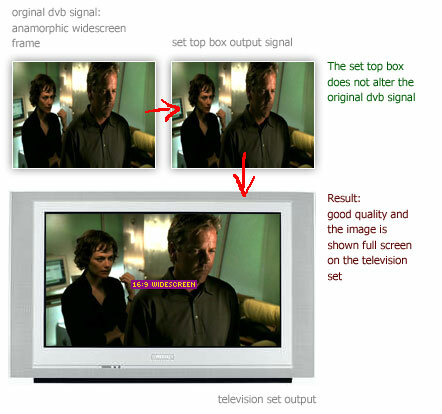 Using this technique it is possible to let the set top box change the way the television set displays the signal that is send by the set top box. In fact, the set top box already uses this. If the set top box is setup to output a 4:3 signal, the set top box already uses WSS signalling to change the television to 4:3. 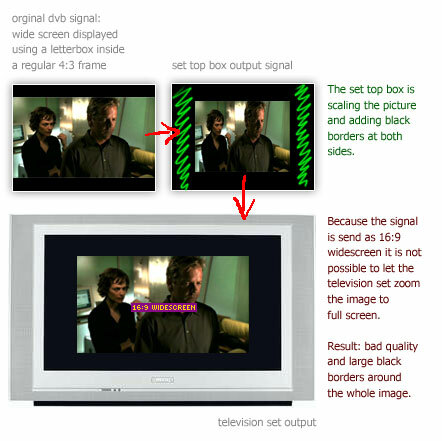 The same thing applies for widescreen, if the set top box is setup to output a widescreen signal, the set top box uses WSS signalling to change the television to widescreen. The idea is to use the content type information inside the DVB stream and WSS signalling at the same time, to make sure the quality of the set top box output is always as good as possible. For example, if the DVB stream contains regular 4:3 content, the image is send unchanged to the television set. Because the image is not horizontally resized, there is no reduction in image quality. The quality is basically as good as it gets. In addition, the set top box sends a WSS signal to the television set, which changes the display mode to 4:3. Again, the same thing applies to widescreen content broadcast using a letterbox inside a 4:3 frame. 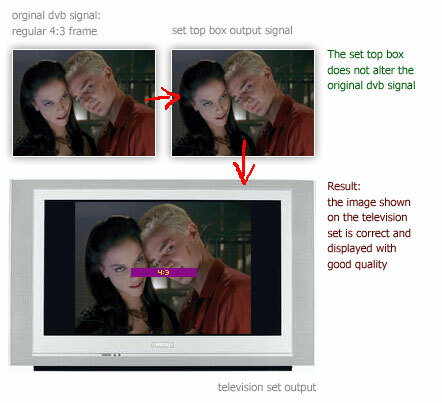 The set top box does not resize the image horizontally, which ensure that the quality stays the same as the original DBV stream. For some content it would be possible to use the WSS signalling function to automatically trigger the zoom function of the television set. If this information is not available in the DBV stream the WSS signalling will change the output mode of the television set to regular 4:3. The user could then manually activate the zoom function. So, again no reduction in quality, and the added benefit that the widescreen content can be displayed in full screen. Just wondering if the UPC digital-Tv service in the Netherlands still suffer from these flaws? It certainly does here in Norway, so I’m very interested to learn if things have changed with you. It cerainly still does in the Netherlands. What happens when the set top box is operating in 4:3 mode? I expect it will do exactly as you suggested. Except for anamorphic content, which will most likely be compressed into a letterboxed 4:3 frame. I ordered UPC Digital myself only last week. Still waiting for the mediabox to arrive, but after reading this page I must say I’m not really looking forward to it that much anymore. It would be great if you could update this article – it is a very good piece, by the way. The UPC set top box firmware is much improved. But I am not sure what sort of WSS signals come out of the box as I am not at all satisfied at the mode switching. The problem could lie with my TV, but it was expensive enough to make me believe it should be able to handle the signals properly. Previous: Leave my keys alone!